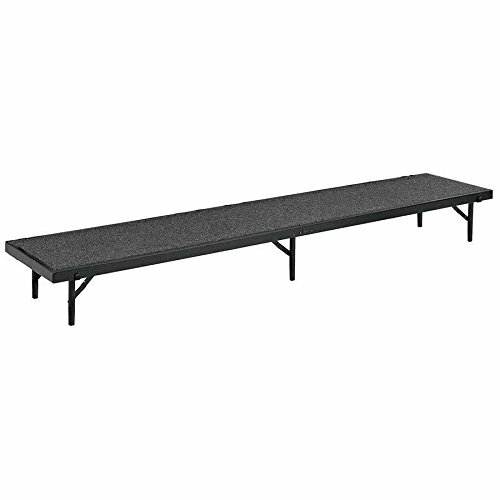 TableTop king Seating RS24C Blue Carpet Straight Portable Riser - 18" x 96" x 24"
Stand a choir or stage a photo with the TableTop king Seating RS24C black carpet straight portable riser! This portable riser is 24" tall, making it the perfect height for the middle of your riser setup onstage. Its black carpeting provides an attractive standing area for a professional appearance during a performance, and it sits flush with other risers of the same height for smooth consistency. For strong support, this riser comes with four durable legs and support up to 200 lb. per square foot. It's outfitted with ganging for fast and easy connections with other stages, and its lightweight structure makes it easy to move. It sits flush with other risers of the same height for smooth consistency.